These Kingdom Hearts Stained Glass Disney t-shirts were designed by the very talented Nicole Graham. According to her Facebook page, she is a 3rd-year Illustration student and an aspiring video game artist/character artist. And according to Twitter, this collection of t-shirts is just for a bit of fun in her spare time. I have posted 33 Disney themed t-shirts (minus a few variations and including Princess Leia) but there were some Legend of Zelda t-shirts on her TeePublic store, too. 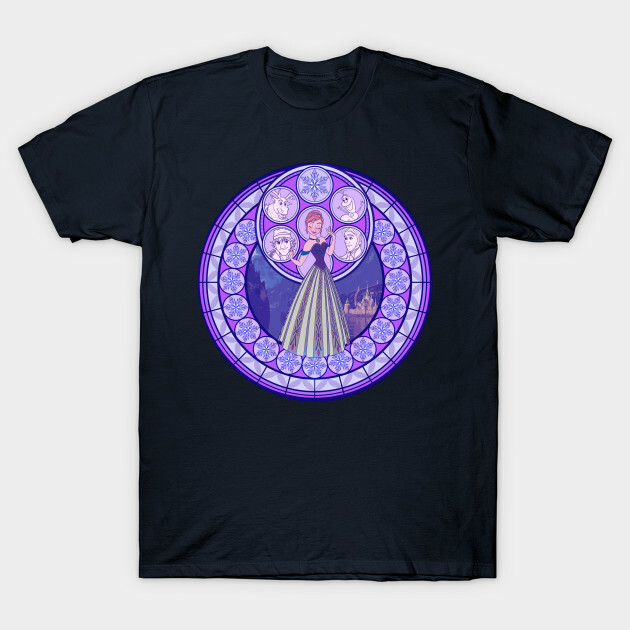 And they have also been done in the style of the stained glass windows from Kingdom Hearts. There is also no sign that this is a completed collection either so if your favorite Disney prince or princess hasn’t made an appearance on stained glass yet, be patient. It may be on the way. See all these Disney t-shirts in Nicole’s TeePublic store.